The same over consuming passion with which Arturo Fuente Cigars came to life in 1912; it is still very much around today. Cigar connoisseurs are unanimous on their approval of quality and craftsmanship excellence invested in the over a century old Fuente Family legacy. The best part is that Arturo Fuente Cigars is as it is yesterday today. Nothing has changed in the more than 100 years of quality, excellence, and tradition of being a world leader in cigars. Fuente Cigars is not like other cigars, this is different! Holding a stick of Fuente is like owning a national honor where you earn the respect of cigar aficionados. 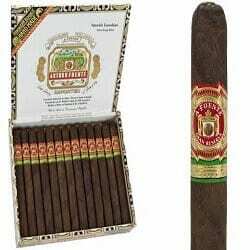 Anyways, Arturo Fuente Cigars is not for newcomers in cigar smoking. Otherwise, the value will not be well appreciated. I am not saying the newbie cannot smoke Fuente Cigar, but you must learn the history behind the jewel of the smoking industry. To get you to know and learn about this highly prized cigar is one of the reasons for this post. 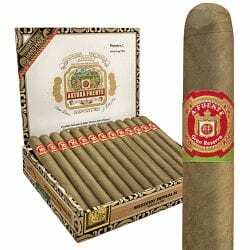 Why is Arturo Fuente Cigars Special? Imagine that feeling when your creditor who is an aficionado walked in with the intention to fight but met you smoking Fuente Cigar, and the next thing he did is smile and request you hand him your cigar and starts to gist about the excellent taste of Arturo Fuente Cigars. As you will soon find out in the features of Fuente Premium Cigars below, we can say without any sense of contradiction that these cigars are unique because of the history behind it. First, it has maintained over hundred years of high-quality handmade production. It has built consistent loyal customers across the world. The company knows how to manage its resources; it retains its birth office in Tampa, Florida; over a hundred years after. It sources its tobacco from the Dominican Republic and works from other countries including Cameroon in Africa, Ecuador in the Caribbean and Connecticut wrappers to maintain consistently high-quality cigars respected by connoisseurs around the world. Second, when you smoke a stick of Arturo Fuente cigar, you know you are smoking one of the finest cigars in the world. Hand-rolled premium cigars. These handmade ultra-premiums are produced in the Dominican Republic. These legendary cigars have grown to be the height of the choicest cigars boasting perfect consistency and unmistaken rich taste in an assortment of premium cigar blends. Family legacy. Today, the Arturo Fuente cigar brand is over 100 years old with the company still located in West Tampa, Florida, its place of birth with production taking place in the Dominican Republic and carefully selected regions around the world. With a whole century of successful legacy, I don’t think Arturo Fuente cigars will be going anywhere, anytime soon. High-quality finish. If you are new to Arturo Fuente cigar, they’re known for their high levels of consistency; the company produces smooth, naturally sweet tobacco blends referred by aficionados globally. It is carefully made. The cigar has managed to retain its legacy of handmade ultra-premium brand released in small batches of minimal quantities, for only cigar enthusiasts who know the quality of the unique brand of cigars. Unequalled satisfaction. With four generations of Fuentes, innumerable over 90% ratings, and a vast collection of fans across the world, Arturo Fuente has been positioned as a completely unstoppable force in the cigar industry responsible for unequaled satisfaction. Of course, cigar aficionados would need an introduction to the various types of Arturo Fuente Cigars, but it is our tradition at Windy City Cigars to educate everyone about cigar and cigarette smoking to be informed about their new hobby. Yes, smoking is a hobby that can bring you in close contact with very successful people around the world. Therefore, you should be well informed about it. 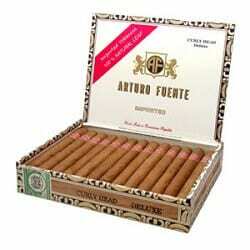 Below are varieties of Arturo Fuente Cigars you will find in our store. Arturo Fuente Brevas Royale Cigars. It has a length of 5½ with a gauge of 42 and corona shape, originates from the Dominican Republic. 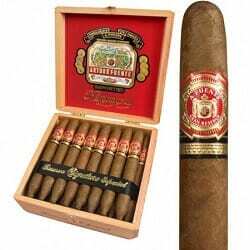 Arturo Fuente Canones Cigars. The length is 8½ with a ring gauge of 52 Gigante shape and origin from the Dominican Republic. Arturo Fuente Churchill Cigars. The length is 7¼, a ring gauge of 48 with Churchill shape; origin from the Dominican Republic. Arturo Fuente Cubanitos Cigars. 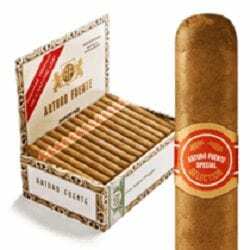 It originates from the Dominican Republic with a length of 4¼ and ring gauge 32 with a Cigarillo shape. Arturo Fuente Curly Head Cigars. The ring gauge is 43 with a Corona shape and 6½ in length, origin from the Dominican Republic. Arturo Fuente Petit Corona Cigars. The origin is from the Dominican Republic, has a length of 5 and ring gauge of 38 with a Petit Corona shape. 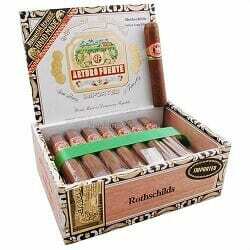 Arturo Fuente Rothschild Cigars. The origin is from the Dominican Republic; it has a length of 4½ and a ring gauge of 50 with Robusto shape and full strength. Arturo Fuente Spanish Lonsdale Cigars. Origin is the Dominican Republic with a length of 6½ and ring gauge of 42 and Lonsdale shape. Arturo Fuente Corona Cigars. This cigar originates from the Dominican Republic; it has a length of 6½ and ring gauge of 46, Corona shape and full strength. Arturo Fuente Brevas Cigars. It has a length of 5½ with a gauge of 42 and corona shape, originates from the Dominican Republic. Arturo Fuente Chateau Fuente Cigars. Origin is the Dominican Republic with a length of 4½ and ring gauge of 50 sporting Robusto shape. Arturo Fuente Double Chateau Cigars. It is from the Dominican Republic and has a length of 6 with a ring gauge of 50 and Double Corona shape. 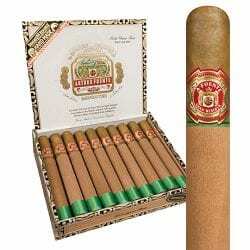 Arturo Fuente Hemingway Cigars. It’s from the Dominican Republic in origin with a length of 9 and ring gauge between 46 and 60 with a Perfecto shape. Arturo Fuente Royal Salute Cigars. It sports a Churchill shape with a ring gauge of 54, measuring 7 5/8 in length from the Dominican Republic. Arturo Fuente Cuban Corona Cigars. It has Dominican Republic origin with a length of 5¼ and ring gauge of 45 with a Corona shape. We don’t associate with the low-quality brand, and as our reputable customers can confirm without fear or favor, we stand only for premium quality smokes. If you want to buy the uncompromising quality of cigars and you need a store where the emblem of quality warranty is boldly implanted, buy your Arturo Fuente Cigars from us. This entry was posted in RYO LifeStyle Blog and tagged arturo fuente, Cigars, ryo, smokers, smoking, tobacco.